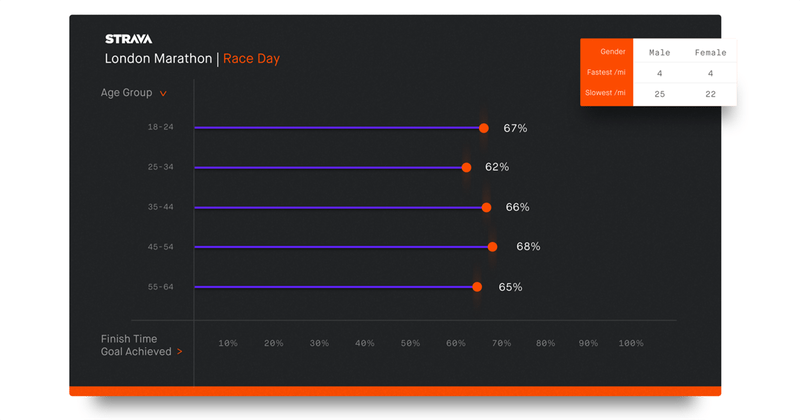 Strava, the social network for athletes, has revealed unique insights into the London Marathon from race and training data taken from last year’s London Marathon runners. The race day data taken from 6,464 Strava runners shows that, on average, runners in the 35-44 age group posted the fastest finishing time. This was followed by the 45-54 age group who finished in 3 hours 56 mins with the youngest age group (under 25s) in third, with an average finish time of 3 hours 59 mins. Across all age groups the average finish time for female runners was 4 hours 23 mins, with the average finish time for men being 3 hours 48 mins. The data reveals that the fastest mile was mile 4 across male and female runners – whilst women had their slowest at mile at 22 and men at mile 25. Running quickly at mile 4 is possibly an indicator of new-found freedom from the crowded early miles allowing runners to ramp back up to their planned target pace. Female runners recording their slowest mile earlier than men might show different pacing or nutrition strategies. The percentage of runners that achieved their target race time was similar across all groups ranging from 62 – 67%, with the 45-54 age group the most satisfied. Across all runners the average longest training run was 34.3 km (21.3 miles) with the majority choosing to train in the late morning (between 8am-12pm). Compared to the weeks prior to their taper, runners reduced their average weekly distance by 35% two weeks before the marathon and 69% in the final week. In contrast, the shorter distances covered during the taper were run at a quicker average pace – 7s per km two weeks out, and 9s per km in the final week – with the reduction in mileage leading to fresher legs. London runners showed themselves to be very chatty, and engaged widely with the Strava community. 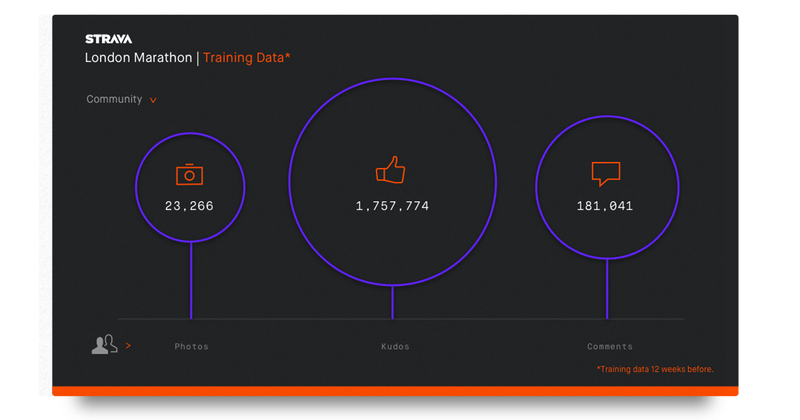 In training, they took 23k photos, received over 1.75 million Kudos and commented 181k times. 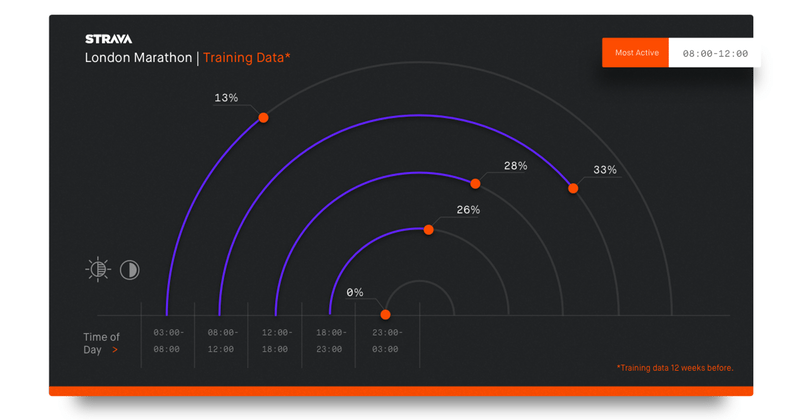 Strava adds that it has a million new members signing up every 45 days, and around 8 million activity uploads put on the platform each week globally. 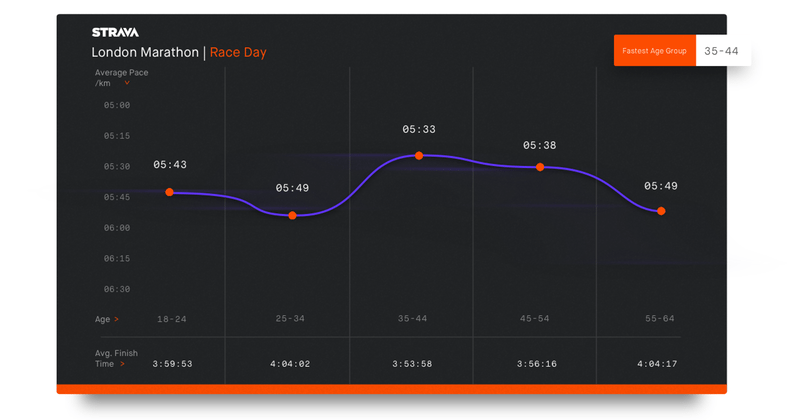 In 2016, globally, Strava runners uploaded 86.7 million runs, with the UK contributing 16.9 million of the runs covering 132 million km.